Remembering Sony's Least Popular "Console"
Sony has released four video game machines that have been, to varying degrees, a success. Today, we're going to look at a fifth that wasn't. That machine was the PSX. A hybrid video game console and home media centre, it may have looked pretty and boasted some impressive technology, but it was also one of the most over-priced and undesirable pieces of hardware this industry has ever seen. Released in December of 2003, the PSX was a brave attempt by Sony to propel its PlayStation gaming brand from a cozy spot under the TV to being the focal point of an entire family's entertainment. It could play PS1 games. It could play PS2 games. It could record live television. It could play DVDs. It could play CDs. You could edit photographs. You could play games online. You could move stuff on and off your PSP. It could also edit audio, edit video, display photographs and even record DVDs. All of which sounds amazing, but remember, half of that stuff could be achieved with a regular PS2 (which is essentially what half the PSX's insides were). The other half was...interesting, but in 2003 either too far ahead of its time or easily achieved in cheaper devices. 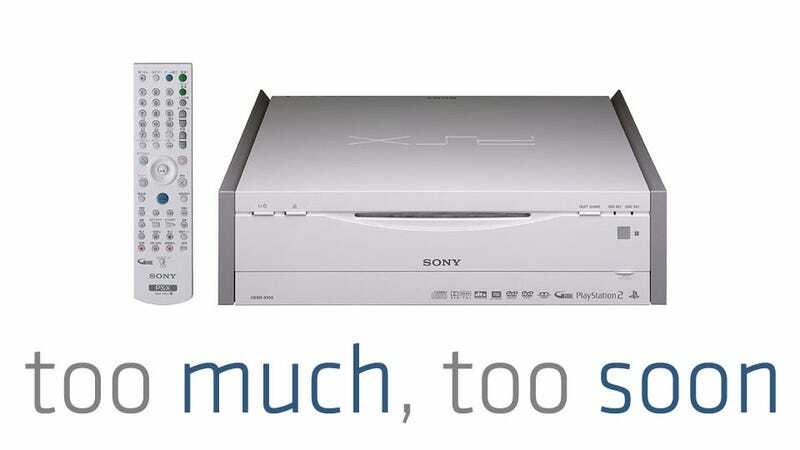 And by cheaper devices, we mean almost anything else, because although the PSX was released in two versions, even the "base" one was ridiculously expensive. The model with a 160GB HDD was priced at ¥79,800 (USD$960). The 250GB model was an insane ¥99,800 (USD$1200). The price, though, was only one factor counting against the success of the PSX. Others included the fact its name was confusing (as "PSX" had become widely-used as an abbreviation for the PlayStation 1), it didn't come with a controller (though you could either plug ones into the back or buy a special USB-powered DualShock 2) and some accessories, like the PS2 multi-tap, weren't compatible with the machine. The PSX was a flop in Sony's native Japan, and as a result was never commercially released outside of the country. If you want to focus on the negatives, you can point towards its exorbitant price and abundance of unnecessary features as forebears of the "$599" disaster that would strike the PS3 three years later. A sign that, even in 2003, Sony had begun to lose the plot a little. Those wanting to look on the bright side, though, consider the fact this was a games console shipping with 160GB or 250GB hard drives in 2003, years before they'd become standard for other machines. It was also, Sony fans may already know, the very first device to make use of the "XMB" menu system which has since found its way onto everything from the PS3 to the PSP to TV sets. Perhaps as a homage to the old warhorse, Sony has kept the PSX's website alive and kicking, six years after the console died off. Meaning you can check out stuff like the PSX's manual!